I have two policy issues. First Issue: I get an error that says Admin actions are defined, but the action policywrite is not allowed! when the helpdesk policy is enabled on the local admin account and users in the admin realm. 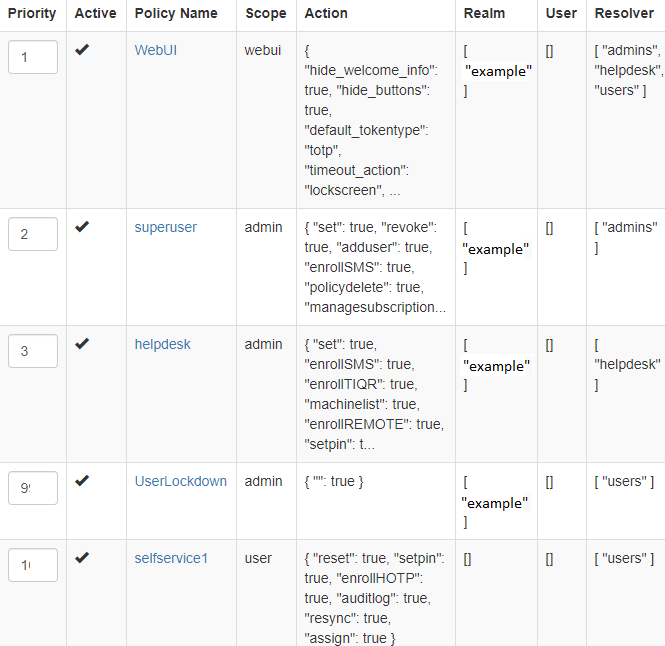 Second Issue: When all policies are enabled, the HelpDesk policy is not applying to users in the ldap resolver. These users are only getting the SelfService policy. admin: LDAP filter configured to look for users in the AD group, admin. when the helpdesk policy is enabled on the local admin account and users in the admin realm. When all policies are enabled, the HelpDesk policy is not applying to users in the ldap resolver. These users are only getting the SelfService policy. Your helpdesk policy probably is a policy in scope admin. This is not used for normal users. => works as expected. @cornelinux, I’ll approach it from a different angle because I think I’m trying to use it in an unintended way. I can only have one realm. In this realm, I want to giver superuser rights to one AD group, helpdesk level rights to another AD group, and then only selfservice rights to the remaining users. Is this possible? I was assuming I could create the LDAP resolvers for these user groups and then filter the policies with them in the User-Resolver field. However, that doesn’t work like I expected it to or I am missing a setting. No, this is not possible. A realm is either an administrative realm by defining this in the pi.cfg or a user realm. An administrator can manage token for other userts. A user can only manage his own tokens. Why do you think, that you can only have one realm?